Around 400 people attended this year’s P.E.A. Awards, in association with Mongoose Energy. This year marked the fifth anniversary of the green carpet awards ceremony that recognises sustainability champions from around the world. Individuals and teams from up and down the UK – from Aberdeenshire to Cornwall – were honoured for setting new standards for sustainability, in sectors ranging from business and shopping to re-wilding and education. The Great British Oceans Coalition swept up, bagging the International P.E.A. Award for Nature, The P.E.A. Award for Team and the Global P.E.A. Award for NGO. The team was also named the 2015’s Overall P.E.A. Champion 2015 for a tireless campaign that has resulted in the UK government agreeing to create the world’s largest marine reserve around the Pitcairn Islands. 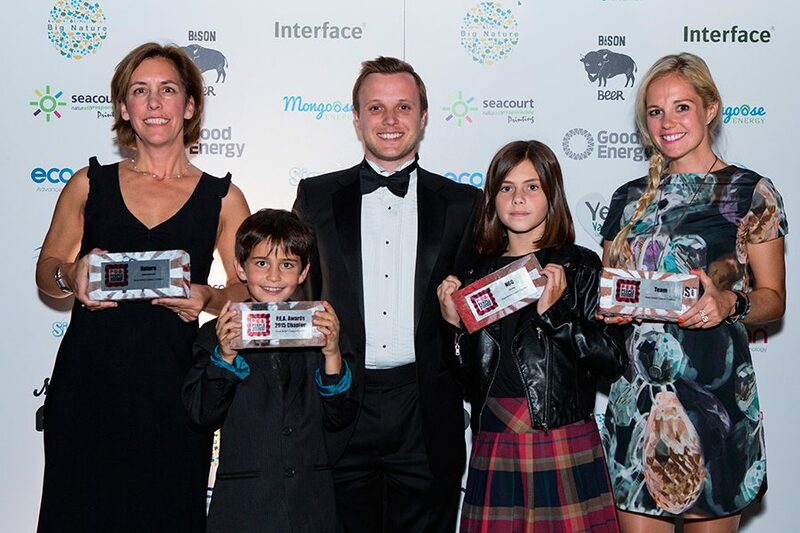 Clare Brook, CEO of the Blue Marine Foundation (part of the Great British Oceans Coalition), said, ‘The whole GB Oceans team was beyond thrilled to win four PEA Awards, including Overall Champion 2015. ‘It’s truly gratifying to have our hard work and achievements rewarded so resoundingly by the PEA Awards. It will give our campaign a huge boost and ensure that everyone – particularly the UK government – continues pay attention. ‘We have already achieved so much this year in getting the world’s largest marine reserve designated around Pitcairn and a manifesto commitment to create a ‘blue belt’ around the 14 UK Overseas Territories. But there is still so much to be done, and these awards have given us all the strength and determination to ensure that Britain leads the world in ocean protection. Two new awards were added to this year’s roster: Britain’s Greenest Family, sponsored by Yeo Valley family farm, and a Nature award, sponsored by Big Nature, to recognise the anniversary of Brighton & Lewes Downs’ UNESCO-designated Biosphere status. The event pulled together all arms of Brighton’s community; Douglas McMaster from Silo – Brighton’s zero-waste restaurant – put the three-course vegan menu together, and the food was delivered by Cashew Catering, Lewes. Food was sourced by the ethical supermarket, hiSbe, with Brighton’s Bison Beer Crafthouse, Boho Gelato and Miss Muffin Top providing drinks and desserts. After growing up on a battery chicken farm that had been in the family since 1600, Jacqueline’s husband Simon was inspired to do things differently. The family has embarked on the life-long task of establishing an organic smallholding. Over two years, St Luke’s crowdfunded £13,700 from the local community to buy solar panels. The primary school now has a 9.7kwp solar rig on its canteen roof, and is committed to using the panels to teach students about renewable energy and the environment. Is this the UK’s most eco-friendly hair salon? Following a £250,000 refurb including LEDs lights, solar panels, a switch to renewable energy, a carbon management plan and recycling programme, the salon has cut costs and boosted profits. In Fylde LOVEmyBEACH works with seven committed groups who remove litter from their favourite beaches. The campaign’s challenge is to work together to keep our local beaches and bathing waters clean. Last year, Lin and Lydia were appalled that, due to council budget cuts, there would be no Christmas tree for the Town of Stanford Le Hope Essex. They have been fighting to improve their community ever since – from reinstating hanging baskets to developing allotments. The woods that back onto this project have become an essential part of its outdoor classroom. The open college uses the woods to help teach some of Brighton’s most troubled youngsters, who can now earn themselves up to GCSE-equivalent qualifications. This school has tackled the major themes of what it means to be sustainable and is always on the lookout for ways to improve and educate the present and next generation. Will Cottrell founded Brighton Energy Coop in summer 2010 after being inspired by community windfarms in Denmark and community solar projects in Germany. In the last four years Brighton Energy has raised £680,000 investment to fund 544kwp of solar PV in the Brighton area, and was able to pay back a £50K loan three years early. This not-for-profit arts education organisation makes positive social and environmental initiatives visible through the powerful medium of world-class documentary photography installed in high-profile public spaces. improves energy efficiency, generates clean energy, or both. All projects also generate a return for society, and capital is quickly recycled into new projects. Philip started ‘gardening for wildlife’ from the day he moved into his house 15 years ago. Now, as many as 6 species of butterfly and a number of moth species actually breed in Philip’s garden as a direct result of the presence of their larval host plants, which have been planted or introduced by Philip. Knepp Castle Estate, near Shipley, West Sussex comprises 3,500 acres, almost all of which is now given over to re-wilding. With its heavy clay and small fields the land was never suited to intensive agriculture so, in 2003, owner Charlie Burrell made the bold step of turning the entire estate over to a pioneering conservation project. Butterfly Conservation is targeting efforts in 73 key landscapes, working with hundreds of landowners and partner organisations to manage habitats to enhance existing populations, restore former habitats and reconnect populations. Working together, The Pew Trusts, RSPB, Marine Conservation Society, The Blue Marine Foundation and Zoological Society of London recently celebrated the government’s commitment to create the world’s largest marine reserve around the Pitcairn Islands. Just under a million square km of the South Pacific will forever remain pristine ocean. From its work with Balcombe, the UK’s poster child for fracking, to its award-winning solar schools initiative, 10:10 is now working alongside voluntary sector buildings in Manchester, schools in Chile and mosques in London. Cool Earth is a charity that works alongside indigenous villages to halt rainforest destruction. 90% of funds go directly to its projects; for every £1 spent on fundraising the charity raises £11.48. This coalition comprises seven like-minded NGOs that champion the creation of the world’s first generation of large fully protected Marine Parks in UK overseas territories. Each year, 50 million litres of paint go to waste. After some years of development, Newline Paints now produces a decorative paint range of some 28 colours, which contain at least 90% recycled paint. For each item sold by this ethical women’s sportswear brand, the company funds one month’s business education for a woman in rural India through a partnership with the Mann Deshi Foundation.The sportswear, designed to suit women of all body shapes, is made in the UK with premium-performance fabric from Italy. This coalition is an example of how a group of teams can achieve more together when they unite as one. Seven like-minded NGOs championed the creation of the world’s first generation of large fully protected Marine Parks in UK overseas territories. With North West Bicester as the catalyst, Eco-Bicester has worked to embed sustainable development throughout the fabric of the whole town. It’s designed to be easily replicable and can be used by all local authorities, particularly in places where new developments are proposed. The Bio-Bus, developed by UK-based company GENeco, is the first bus in the UK to be powered by gas derived from food, sewage and commercial liquid wastes. The bus can travel over 300km on a full tank of gas – produced by the annual food and sewage waste of just five passengers. This eco-resort has a firm spot on the sustainable tourism map, in part because of its dry composting toilets, grey-water treatment, eco-building techniques, organic gardens, rainwater catchments, native tree planting and full-scale recycling – but mostly because of its community projects. ‘What a year for the Great British Oceans Coalition! This group of NGOs has achieved something incredible: following a long campaign, the UK government has decided to create the world’s largest marine reserve around the Pitcairn Islands. ‘Oceans touch every continent around the globe and, in the UK, we’re never further than 70 miles from the coast. They’re the source of where we’ll be most affected by climate change, so resolving issues in the ocean will have a huge knock-on effect.